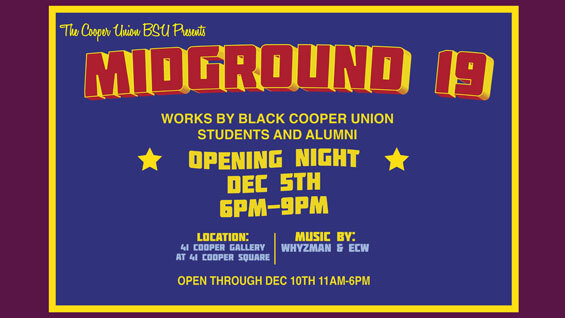 “Midground 19,” an exhibition of work by Cooper students and alumni of African descent, opens in the 41 Cooper Gallery on Tuesday, December 5 at 6 PM. It is the second in a series of three shows being curated by art senior Alfred Dudley III, “Background 19,” from this past fall, and “Foreground 19” to open in Spring 2018. It’s important, he notes, to see all three as interrelated. “I wanted to represent the collective experience of being at The Cooper Union, specifically for students of African descent, with the language of perspective points as a point of departure,” he says. "There's a pedagogical influence on the production of work in this school that is high pressure and high-output demanding," he says, but there is little support for shows that present any one group's experience. He took on the curation of these three exhibitions as a way to address that problem, though he stresses that the work isn't supposed to represent a unified voice. On the contrary, he wants to demonstrate multiple solutions to boundaries imposed by racism, direct and structural. The exhibition will include art work by Ta-Shea Brown, Jermaine Carter, Christ Coryat, Jhakai Deshong, Mr. Dudley, Evan Hall, Braden Hollis, Emily Manwaring, Gilberto Mena, Looney Santana, Rachel Eulena Williams, Omar Wiseman, and others. Mr. Dudley’s decision to curate the three shows was inspired by the F shows at the Studio Museum of Harlem as well as by a show organized by Professor William Villalongo when he was a student in the School of Art. Entitled, “Shaded Voices,” Professor Villalongo’s exhibition spanned a 20-year period and included work from alumni, among others, Marina Gutierrez, Jeanne Moutoussamy-Ashe, Juan Sánchez, Sol’Sax, John Bright, Erica Mapp, Colin Chase, and Tony Gonzalez. The opening includes performances by Whyzman and ECW. The exhibition runs from December 5–10, 11 AM to 6 PM.